I’m sure you remember this really wonderful piece of music from the Rodgers & Hammerstein musical, Carousel, which debuted in 1945 and is still being performed here and there around the world. This song is sung by Nettie, who runs the local seafood restaurant, after Julie, a factory worker, who has married the incredibly handsome and totally wrong for her carnival barker, Billy Bigelow. Julie has told Billy she is expecting and he, in a misguided effort to provide for his soon-to-be baby, engages in a robbery and is shot to death. Julie weeps over his body and sobs to Nettie, “He’s dead! Nettie, what am I gonna do?” Nettie replies that she’ll come stay with her, she’ll keep going and then sings, “You’ll Never Walk Alone.” This song reduces everyone in the audience to tears and is truly one of the greatest lyrics ever. Now, with that lengthy explanation, here’s what I want to share with all of you out there in blog-land. There’s a concept going around, brought to my attention by Michelle Griep, successful author and blogger. Look her up, check out all her books and be amazed. Anyway, the concept is to pick one word to be your New Year’s resolution or mission statement for the year. There was even a book a few years back: My One Word: Change Your Life With Just One Word by Mike Ashcraft and Rachel Olsen. This is totally cool as you can immediately scrap all those difficult resolutions like reading all the great books in one year, losing twenty pounds, cleaning out the garage, taking all the clothes out of your closet that are really out of style – yes, I know we hang on to those things we adored ten years ago, but friends, they’re out of style and there’s a big red spaghetti sauce spot on the front. This picture is a pencil drawing by my Dad, Kim Weed, and to me, it is the personification of HOPE. 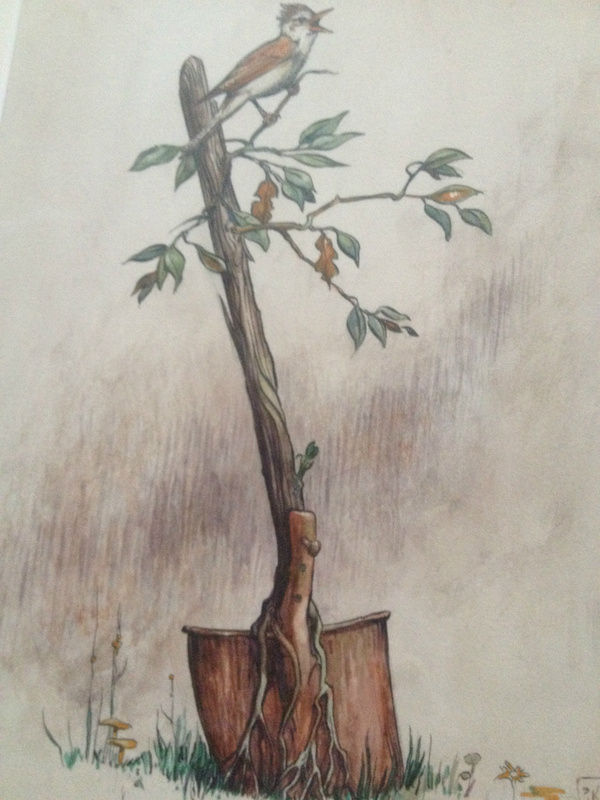 Look at it closely, friends, the rusty shovel planted in the earth, the wooden handle sprouting new growth and a beautiful bird resting on the new, totally impossible branch.